We decided to go out for drinks in the burbs. Since K and I live in Ardmore/Havertown, I decided that Verdad in Bryn Mawr would be a nice option to try. It hasn’t been there that long, I think it’s now occupying the spot where Carmine used to be for what now seems to be a split second. Verdad bills themselves as latin influenced tapas. So it’s small plates here. It’s a pretty nice place. The people inside seemed fancy. We were certainly classing down the joint, ha. 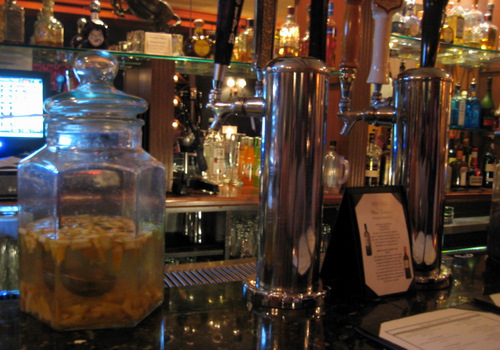 They have tons of tequila, sangria that you can see in these big jugs, and beers on draft as well. 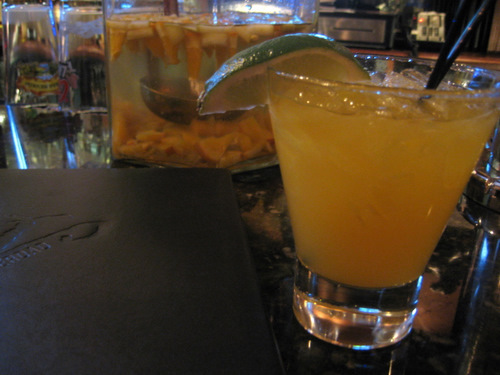 I got a passion fruit margarita, which was rather awesome.It wasn’t super sweet, it was nice and boozy, and yet had plenty of passion fruit flavor. The girls both got the caipirinha, and they were also nice and boozy. They don’t skimp on the booze, which is nice, since the drinks are priced accordingly, and with main line prices. K was feeling a bit peckish so she ordered the tortilla soup. Now I’ve had my share of mexican tortilla soup in my day, but this one was strange. 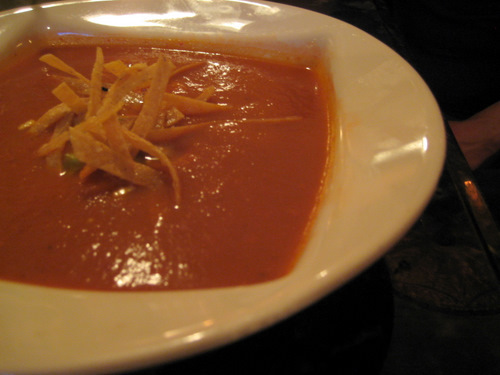 It looked like creamy tomato soup, with some tortilla strips thrown on top. That’s not normal. There’s not nearly enough tortilla strips. The avocado is pretty invisible. It was just lacking… content! And K wasn’t crazy about it. At the end of the night, she realized it was pretty crappy. So the one food dish turned out to be disappointing, but I was definitely a fan of the drinks. I would certainly return for cocktails!